UPDATED – WASHINGTON (CNS) — Ursuline Sister Larraine Lauter has a vision of virtually eliminating the threat of cholera across Haiti. She’s counting on young mothers and a simple high-tech water filtering system manufactured by a Florida company. It costs $60 to ship, install and train users how to operate the system to achieve what some might consider impossible. Sister Lauter’s 10-year-old organization, Water With Blessings, based near Louisville, Kentucky, has distributed filters and prepped thousands of women in maintaining the system in the impoverished nation since 2012. The program, called Village by Village, started in Verrettes, Artibonite department, from where cholera spread beginning in 2010. Sister Lauter said reports of cholera in communities with the system in place have dwindled to zero. Haiti has been plagued by the water-borne disease that causes severe vomiting and diarrhea since October 2010, when U.N. troops from Nepal dumped untreated human waste into a river in the central part of the country. Left untreated, cholera can kill a person within hours of the onset of symptoms. In eight years, nearly 9,800 people have died from the disease, according to the Haiti’s Ministry of Public Health and Population. The number of deaths this year through Oct. 20 stood at 38, down from 159 in all of 2017, the government reported. Sister Lauter has found that women are the key to success. “A great untapped resource in human development is young mothers, if you can seek them out. They’re literally out of sight, often the least educated and thought to be the least likely to succeed in their community,” she told Catholic News Service. Each “water woman” who joins the effort must agree to maintaining the water system, which serves four households. Each system consists of a filter about the size of the cardboard toilet paper tube, a hose and a 5-gallon bucket. “This program is very radically rooted in Catholic social teaching, and one of those teachings, which is very poorly understood, is subsidiarity. Subsidiarity is that you take the power for the solution to very lowest level possible,” she said. The Sawyer PointOne filter is the centerpiece of each system. It is produced by Sawyer Products based in Safety Harbor, Florida. The company has supplied water filtering systems for outdoor enthusiasts for more than 30 years. The hollow-fiber-membrane filter is dense enough to block the passage of bacteria and other harmful microscopic life. The design also allows for easier cleaning and a longer life in the field, said Darrel Larson, the company’s international director. He told CNS the company’s owners are motivated by their faith to make the filters available at discounted prices to nonprofits such as Water With Blessings. “It’s just a bit of a call of God on the people who own the company to be able to use this as a resource to make the world a better place,” he said. The company also has donated filters to agencies responding after natural disasters, including those serving families in Puerto Rico and Texas after the 2017 hurricanes. Beyond Haiti, Water With Blessings has identified more than 82,000 water women in more than 45 countries. 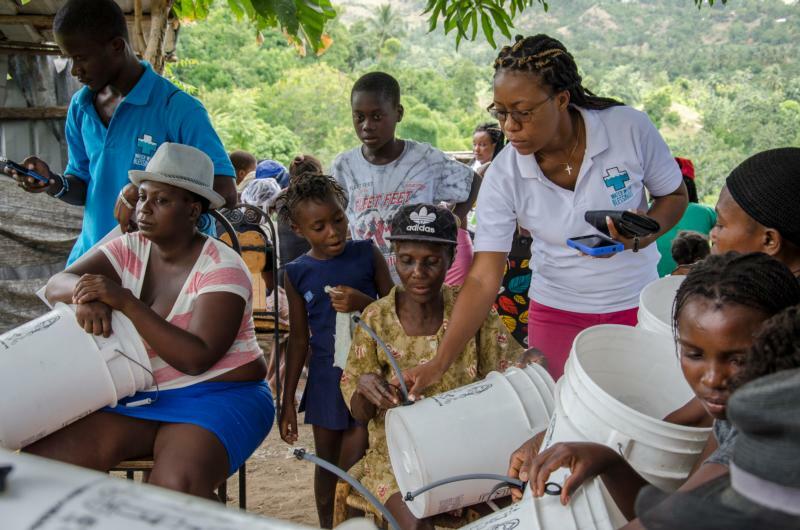 Sister Lauter told CNS she believes the system can solve Haiti’s cholera dilemma quicker and at far less cost than the years-long efforts of the U.N. and larger and more well-known nongovernmental agencies. She estimated that for $30 million to $35 million, her organization could install the filtration systems across Haiti. She is soliciting donations to accomplish that goal. “Our model requires a lot of intensive training of these women. It’s the responsibility of local leadership. We are trusting that all people, even the most poor, have the capacity to love and serve others, because they are made in the image and likeness of God,” she said. Sister Lauter added that her organization will continue introducing filters as widely as possible in Haiti until the disease is eradicated.